In May 2001, engineer Paulina Zelitzky, President, ADC Corporation, Victoria, B. C., Canada and Havana, Cuba, announced the discovery of megalithic structures 2,200 feet down at the western tip of Cuba. November 19, 2001 Havana, Cuba - The story about a possible megalithic site half a mile down off the western tip of Cuba first broke this past May when a Reuters News Service reporter interviewed the deep ocean engineer who first reported unusual sidescan sonar of the discovery. Her name is Paulina Zelitsky. Ms. Zelitsky was born in Poland, studied engineering in the Soviet Union, was assigned to work on a secret submarine base in Cuba during the Cold War, and eventually defected to Canada. There she met her current husband, businessman Paul Weinzweig. Now the couple own and operate a company called Advanced Digital Communications, or ADC, with offices in both Victoria, British Columbia, and Havana, Cuba. Their specialty is deep ocean exploration. ADC made news in November 2000 when Paulina Zelitsky found the wreckage of the famous U.S.S. Maine that blew up and sank in 1898. It was three miles off the Havana coast and two-thirds of a mile down. Her team videotaped the battleship which matched old photographs. Now this year, Ms. Zelitsky reports that about 2,200 feet off Cuba's western tip she has found "a huge land plateau with clear images of what appears to be manmade large-size architectural designs partly covered by sand. From above, the shapes resemble pyramids, roads and buildings." Mayan Acropolis at Piedras Negras, Guatemala. Drawing by Tatiana Proskouriakoff from Breaking the Maya Code © 1992 by Michael D. Coe. This week I talked with both Paulina Zelitsky and Paul Weinzweig and learned that in addition to the sonar images, this late summer they were able to get some light and a videotape camera down to the underwater site in a Robotic Ocean Vehicle known as an ROV. Over the past several months, I have had an agreement with Mr. Weinzweig in which I can discuss their progress with the site, but will only report publicly when I have permission. The following is the portion of our most recent discussion on the record for broadcast that includes the surprise of Paulina Zelitsky joining the interview. Interview Paul Weinzweig, Partner, Advanced Digital Communications, Victoria, British Columbia, Canada: "IS THERE ANYTHING THAT YOU CAN SAY ON THE RECORD THIS MORNING THAT I CAN DO SOME KIND OF AN UPDATE? For the record you can say that the Center for Marine Archaeology and Anthropology at the Cuban Academy of Sciences is currently analyzing video data which we have from the perimeter of the site from megalithic stones. They are working on inscriptions that they have detected on these stones and they are analyzing them at this time. WHAT ARE THE ESTIMATED SIZES OF THESE STONES? 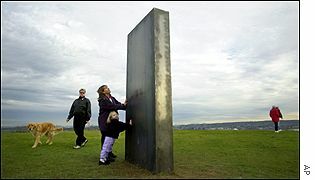 AND YOU MENTIONED POSSIBLY THE SAME KIND OF LOOK AS THE PERIMETER STONES AT STONEHENGE? THAT KIND OF RECTANGULAR LOOKING? Yes, the same kind of stone that you see on Eastern Island and in Stonehenge. Very large and smooth and light colored that bear no relationship to the surrounding ecology. And also there is evidence of smooth cut and fit, that is one on top of another, as if the basis of a pyramid or large building. AND ON THOSE STONES, WHERE ARE THE POSSIBLE INSCRIPTIONS? YOU KNOW, LIKE TOP OR BOTTOM OR MIDDLE OR? They are not anywhere specific on the stones, these inscriptions. They could be in the middle of the stones and various parts of the stones across. One thing we found, the anthropologist found, was an American cross. It's a Central American cross. IS THAT WHERE TWO LINES ARE CROSSED PERPENDICULAR TO EACH OTHER WITH ANYTHING SPECIAL ON THE ENDS? No. They are not two lines. They are two oval shapes crossing each other. TWO LONG OVALS CROSSING EACH OTHER THE WAY A CROSS CROSSES? Yes, The way a cross crosses, only the shape is not a single line. It is a flattened circle. DO THESE SO FAR FROM WHAT YOU HAVE SEEN ON THE VIDEO SEEM TO BE INSCRIBED INTO THE STONE LIKE A QUARTER OF AN INCH OR HALF AN INCH? Yes, we can't tell really the depth. There is limited lighting and limited perspective as well because of the - we had technical problems with the ROV. IT IS REALLY DARK AT A HALF MILE DOWN, ISN'T IT? Well, there is no light at all except for what we provide. SO YOU ARE LIMITED IN ONLY WHAT YOU CAN GET IN THAT LIGHT IN FRONT OF YOU? That's OK. We have good lighting now and we have a low light camera to add to our two or three other cameras we have there as well. To our zoom camera and we have several cameras that work down there and we have good lighting. There was a lot of debris in the water at that time, created by a strong current, probably by plankton. WHEN DO YOU THINK YOU WILL BE ABLE TO GO DOWN WITH ALL THE CAMERAS FUNCTIONING? Well, hopefully, if we get all our systems back together within the next two months and we get a break in the weather. AND THE MUSEUM THAT IS TRYING TO ANALYZE THESE CARVED INSCRIPTIONS YOU HAVE SEEN SO FAR, HAVE YOU HAD ANY INDICATION THAT THEY THINK IT MATCHES ANY KNOWN ANCIENT SCRIPT? We don't have any conclusions yet. They are, the analysis is still in process. HAVE THEY MADE ANY COMMENT ABOUT THEM, THE SYMBOLS OR CARVINGS? I said the lettering is Greek-like. Hold on just a minute. Why don't you talk to my boss. OK, I WOULD LOVE TO. Her name is Paulina Zelitsky. HELLO. I'M SO HAPPY TO MEET YOU ON THE PHONE. Yes, thank you. I was overhearing my husband and I don't want you to make any bad mistakes mixing Greek, because it is not Greek. It has the same tendency, but it is not Greek. We don't know what it is and scientists are trying to decipher it. RIGHT. IT HAS SOME RESEMBLANCE IN LETTERING TO GREEK, BUT IS NOT GREEK. AND THERE ARE SOME LIKE PICTOGRAPHS THAT WOULD FALL INTO THE HIEROGLYPHIC CATEGORY AS WELL? Yes, and symbols as well. There are different signs, more like American nature, like they have found in Central America. Pyramids. And strong delineation of the structures which suggest pyramidal type, American pyramidal type, not Egyptian pyramidal type. OK, YOU MEAN BY THE GLYPH SYMBOLS THAT WOULD BE FOUND IN MESOAMERICAN PYRAMIDS? AND AN EXAMPLE IS THAT CROSS MADE OF OVALS CROSSING EACH OTHER? Yes. Yes, and other symbology, other cosmic type depictions. And you find this in Cuban caves around the island, not only in the south but in the north. And those caves are underwater caves. One cave I know of is on land and it has this type of symbology as well. AND WHEN ARCHAEOLOGISTS HAVE STUDIED THE CARVINGS IN THE CAVES ON CUBA, HAVE THEY BEEN ABLE TO MATCH THOSE SYMBOLS AND GLYPHS TO ANY OTHER PRE-EXISTING KNOWN LANGUAGE? They are trying to match it to Central American, but it is distinctive on its own. It's very difficult to say that ancient American symbology is identical to this. It is not identical. It's similar, but not identical." After hearing about the symbol of crossed ovals and mysterious lettering, I began searching. I called the Archaeology and Anthropology Department at the University of Pennsylvania which has one of the finest collections of Olmec, Mayan and other Mesoamerican artifacts in the world. This weekend I spent several hours searching the library's rare books of Mayan and Mesoamerican glyphs. I could not find a single cross of ovals until I opened up a book called The Language of the Sea Peoples. There in a section comparing hieroglyphs from the Minoan island of Crete with hieroglyphs known as 'Linear C Language" used by an ancient Minoan culture called 'Luwian,' I found it. The Language of the Sea Peoples © 1992 by Fred Woudhuizen. I ALSO FOUND A MORE COMPLICATED CROSSED OVAL SYMBOL IN ASSYRIAN HIEROGLYPHS. Identified as Assyrian "solar cross"
in The Mammoth Dictionary of Symbols © 1996 by Nadia Julien. I SENT BOTH OF THOSE SYMBOLS TO PAULINA ZELITSKY FOR COMMENT. SHE E-MAILED BACK TWO COLOR PHOTOGRAPHS SHE HAD TAKEN INSIDE A CUBAN CAVE THAT INCLUDED YET DIFFERENT CROSSED SYMBOLS WHICH YOU CAN SEE IN MY EARTHFILES.COM REPORT. Cuban cave photographs © 2001 by Paulina Zelitsky. How would an ancient Minoan symbol end up a half mile down amid other apparent megalithic structures off the western tip of Cuba? I took that question to the Editor-In-chief of Ancient American magazine, Frank Joseph. Frank has studied the end of the Bronze Age around 1200 B. C., which was three thousand two hundred years ago. He is also the author of a 1998 book entitled Atlantis In Wisconsin. He has another new book about to be relased entitled Edgar Cayce's Atlantis and Lemuria. That book will be in stores by the first of December. And a third book to be released in 2002 is called The Destruction of Atlantis. Frank Joseph has devoted more than two decades to studying physical evidence of a global Atlantean culture which he believes was destroyed in a worldwide catastrophe in 1200 B. C. that ended the Bronze Age. In the September/October issue of Ancient American magazine, there is a brief article entitled 'U. S. Navy Atlantis Cover-up?' It says that on September 7, 2001, a team from Spain and the U. S. looking for oil have been "250 miles southwest of the Azores equipped with bathescape and two submersibles researching a 90-kilometer ledge with a central temple supported by three stands of nine pillars about 3 feet in diameter supporting a flat stone roof about 20 feet wide and 30 feet long. There are the remains of five circular canals and bridges, plus four rings of structures like the temple in between. It is roughly 2,800 feet deep in the Mid-Atlantic Trench and stable at this time." According to the researchers, when they tried to send photographic images from the site, their signals were jammed by a U. S. Naval exercise nearby, perhaps inadvertently. Frank Joseph and I are still trying to confirm this report, but the depth of 2800 feet is around that half mile depth in the Cuban site. This weekend I asked Frank about the crossed oval symbol in the Linear C language of the Luwian. Frank Joseph, Editor-In-Chief, Ancient American, Archaeology of the Americas before Columbus, Colfax, Wisconsin: "The Luwians were a peoples who lived about the same time as the Trojans that lived in what is now Turkey. They were either an ally of the Trojans, a close ally during the Trojan War and before. Or else in fact, they were Trojans. Some Luwian script has supposedly been found in Italy and they think that is an important link between the Etruscans and Asia Minor, or what is now Turkey. And the Luwians were maritime people, very proficient at sea. AND THIS CROSSED OVAL SYMBOL OF THEIRS RELATED TO WHAT IS LETTERED AS 'LU' IS ALSO GOES ACROSS ALL THE COLUMNS IN COMPARISON TO OTHER LANGUAGES WHERE THE SYMBOL APPEARS TO MEAN 'STAR." A star, yeah. But maybe. That "lu" that is repeated is like they are identifying themselves, the Luwians. They might have called themselves the "lu." It is very interesting. That whole cultural context is Atlantean because the Atlanteans were plugged into the Trojans. The Trojans themselves had a story of Atlantis. Their founder was Dardanus who came from Atlantis. Elektra, when she was sinking into the sea. This is highly complex, thinly woven stuff, you know!! CAN YOU PLEASE SHARE THE STORY FROM THE TROJAN POINT OF VIEW ABOUT ATLANTIS? The Trojans were a people who built their city around 3,000 B. C. And they chose that spot at the Dardanelles because it was a very valuable place for trade between the East and the West. You had access then to the Black Sea. Whoever controlled the Dardanelles controlled trade. So Troy over time became a very wealthy city. And the myth of Dardanos is that he was born on an island far away to the West. And his mother was Elektra. Her father was Atlas, the name of the island that Atlantis was on. She was the daughter of Atlas and her mother was Clione. WELL THIS IS VERY SIMILAR TO WHAT PLATO TALKS ABOUT. And Clione was the sea goddess who produced what is known as the Pleiades. And Pleiades means daughter of Atlas which is Atlantis. That's what Atlantis means, daughter of Atlas. PLEIADES MEANS DAUGHTER OF ATLAS? Pleiades means daughter of Atlas. It is a poetic way of saying this is on Atlantis. WELL, THE FACT THAT THERE COULD HAVE BEEN AN ATLANTIS THAT HAD BASES THAT SPREAD ALL THE WAY FROM WEST OF THE STRAITS OF GIBRALTAR THAT MIGHT HAVE INCLUDED THE AZORES, THE CANARY ISLANDS AND DOWN ACROSS THE ATLANTIC IS WHAT BEGINS TO EMERGE AS A GREATER TRUTH. Absolutely. Right. Now, the relationship between Atlantis and Troy is not the same as the relationship between say Atlantis and the Yucatan, for example, where they had an allied kingdom. They really owned the Yucatan. Or they would own parts of Ireland and Spain. That was really plugged in tight to the Atlantean Empire. HOW FAR BACK WOULD YOU PUT THIS SINCE PLATO SAYS GOING THROUGH SOLON AND IN THE CRITEAS '9000 YEARS' AND THAT WOULD PLACE IT AT ABOUT 11,500 YEARS AGO? No, that's another story altogether. My colleagues and I have worked very hard since the 1980s on these dates. And those dates are a mistake, that was a mistake in translation. The Greeks used a calendar that was very similar to ours. They used a solar calendar of about 365 days. A standard solar calendar. The Egyptians used a minimum of five different calendars and their, including a solar calendar. Their priests and holy places where they had the story of Atlantis which was at the holy place called the Temple of Knife in Egypt. They used a lunar calendar. We concluded that the Egyptian priest, when he said 9,000 years, is talking about lunar years and not solar years. There is abundant evidence to show that is exactly what he was saying. And the Greeks, when they heard this, they thought solar years. So when Plato ­ all of the numerical values in the Criteas and the Timaeus are totally inflated beyond reality. They do not work with the description that Plato gives. Plato describes a late bronze age citadel or city. There was a huge gap in knowledge between Plato's and Solon's time and what happened in Atlantis. Because we now know that when the Bronze Age stopped suddenly around 1200 B. C., that for the next 400 years at least there was a period of profound Dark Age. There was no more writing. There was no more building of cities. The population of the world had decreased phenomenally. There was widespread burning. The entire Black Forest of Germany was incinerated. Every, not virtually, but every known archaeological site in the Near East and Asia Minor were burned. It is now understood that there was a major catastrophe of which Atlantis was only a small part that whipped around the world in a band literally from about Iceland to oh, say, the middle of North Africa. It affected North America, went right through the Pacific. There was a symposium of archaeo-astronomers back in 1997, not New Age people at all, in England, in which they found that probably the greatest natural catastrophe human beings ever witnessed was around 1200 B. C. And that was when two or more comets, including Haley's Comet, converged in the skies over earth and showered the world with a barrage of asteroids and meteors that pushed human beings to the brink of extinction. And Atlantis was especially hard hit because there are two Swedish physicists, Thomas Larsson and Lars Franzen, who established in 1997 that several asteroids - I'm not talking about meteorites - several asteroids! collided in the eastern Atlantic precisely in the location of Atlantis and that is why we can explain why an island the size of Atlantis which was 6,000 square miles - it was not a continent, it was a big island. And it was destroyed. If you have an island out in the middle of the water and it's hit by several nuclear blasts at once, the chances of that thing being around are slim. AND WHAT YOU MEAN IS THAT THE IMPACT OF THESE BREAKING OR COLLIDING ASTEROIDS WOULD HAVE BEEN EQUIVALENT TO ATOMIC BOMB FORCES HITTING ON THE ISLAND? Probably H-Bomb forces. And they didn't even have to hit the island itself. The island was part of the Mid-Atlantic Ridge which is a very unstable part of the planet geologically. You could have an asteroid collision hundreds of miles away, but if it hit the Mid-Atlantic Ridge - that's the end of that island. THAT IT MIGHT LITERALLY CONNECT TO THERE HAVING BEEN SOME KIND OF STRUCTURE THERE IN THIS 1200 B. C. TIME FRAME? Yeah, I think so. It works out real well. Unfortunately, I have not been able to verify that report anymore than you have seen. But I would bet that it was part of the 1200 B. C. destruction because it was so massive at that time. We know for example that many parts of the world like Britain and Germany lost 9/10th of their population all at once. So, we're dealing with a massive, almost an extinction, human extinction, in various parts of the world all at the same time. And I think that's entirely possible. That would explain also perhaps how this structure now found off Cuba is where it is. We understand that possibly that it was part of a much larger complex. I'm beginning to think that what they are finding there was much larger originally, and what they are finding now is only a small part, a remnant, that was perhaps on a kind of shelf which sank vertically. That is not impossible. Things like that have been known to happen before in the Atlantic and that this part remained upright and that's what they are finding." One of the most mysterious cultures on earth are known as the Etruscans. Twenty-five hundred years ago they lived in a region of Italy known as Tuscany. No one knew who they were or where they came from. The Etruscans were skilled sailors and craftsmen and they left behind carved in stone blocks, columns and other artifacts a language that no one has ever been able to translate. It resembles Greek, but is not Greek. Frank Joseph: "I haven't seen what they found down there. It sounds like if it looks Greek, but isn't Greek, that might be that it's Etruscan. I'm not saying the site underwater is an Etruscan site. That's probably unlikely. The Etruscans did not build things that look like Teotihuacan, that's for sure! But the Etruscans, where did they get their written language? It's possible that what we're looking at in Etruscan is a variation of the Atlantean language. We don't know what the Atlantean written language looks like. But it appears to be the precursor, not just of Greek, but other written languages in other parts of the world. So, it's possible that if they look to Etruscan, they might be able to see some similarities. That's not much help though. Even if they identify it as Etruscan, they won't be able to read it because the Etruscan written language as not yet been deciphered. They've gotten some names off it and little snatches of things, but the language itself is really bizarre because it is a Greek type written language, but the language itself is more like Turkish or something. It's really very perplexing. The Etruscans are far more directly connected to Atlantis because Plato in his discussion of Atlantis mentions the Etruscans specifically as being an outpost of Atlantis, that the Atlanteans came to western Italy and set up their estate there and sort of inter-married with the people and created what became known as the Etruscans. NOW FROM THE WORK YOU HAVE DONE ON ATLANTIS RESEARCH ­ AND I THINK IT'S FAIR TO SAY YOU ARE CONVINCED THAT PLATO'S DESCRIPTION AND HERODITUS OF THIS ATLANTEAN CIVILIZATION THAT IT REALLY DID EXIST. WHAT DO YOU KNOW ABOUT THE ATLANTEAN CULTURE IN THAT PERIOD FROM 3,000 TO 1200 B. C. BASED ON WHAT YOU'VE STUDIED? What I can tell you is that the Atlanteans who developed on an island outside the Straits of Gibralter developed an extremely powerful sea civilization. They were great seafarers. Plato described the Atlanteans as great seafarers and great miners. And that works out extremely well with the copper mining that took place in North America ­ I'm not going to get into that, but there was a major copper mining enterprise that involved a minimum of half a billion tons of raw copper being removed and disappearing during that time period. And I believe the Atlanteans fit the bill for that. AND THIS WAS THE 5,000 MINES OF THE NORTHERN PENINSULA OF MICHIGAN THAT ARE EACH ABOUT 60 FEET DEEP? Well, the average depth is probably like 20 feet deep for the pit mines, but there were many pit mines that were excavated through solid rock 60 feet down. So, whoever did that obviously had a technology far beyond anything that was known to the native Americans at that time who were not interested in anything more than float copper, copper they picked up off the ground. But this is one of the great - I hate to use the word conspiracy, but it certainly is suppressed evidence that American scholars have known about for more than 100 years that there was a huge copper mining enterprise in upper Michigan that lasted from 3,000 B. C. to 1,200 B. C. - those magic dates again - in which a minimum of half a billion pounds of the world's highest grade copper was excavated and disappeared. Meanwhile on the opposite side of the world, the Bronze Age erupts and bronze is only made through high grade copper combined with zinc and tin. So, I think that what Plato was talking about are these ancient copper miners who were able to mine through their tremendous technological development and ship this huge prodigious amount of raw copper to Europe where it became the merchants, the copper barons, of the ancient world and that is what made them so phenomenally wealthy and powerful. WELL, AN INTERESTING POSSIBLE DISCOVERY IN THIS UNDERWATER MEGALITHIC SITE THAT'S UNDER RESEARCH IS THAT IN SOME OF THE SONAR DATA, NOT THE VIDEOTAPE, BUT THE SONAR DATA, THERE ARE SOME RETURNS THAT SUGGEST THAT THERE MIGHT BE METAL, LIKE METAL ON THE TOPS ON SOME OF THE OBJECTS. WOULD THE USE OF METAL AS SHEETING ON STRUCTURES BE SOMETHING THAT WOULD BE ASSOCIATED WITH THE RESEARCH ON ATLANTIS? Well, now we are getting really close to the Atlantean realm. Plato tells us that at the height of their prosperity to show off their wealth, would actually sheet their outer walls of the city with great sheets of what he called 'orichalcum.' Orichalcum means nothing more than high grade copper which didn't exist in Europe in large numbers like North America. So, here were people who used a design technique, an architectural technique of including sheets of precious metal in their walls and now we are finding this supposedly at a site underwater off of Cuba. I would say now we are beginning to narrow in on a cultural commonality. FRANK, WHERE DO YOU THINK ALL OF THIS IS HEADED? I know exactly where it is headed. Some time this century, the greatest archaeological find in history is going to be made when identifiable remains of Atlantis are going to be found. And the beginnings of that began in 1968 when they found the Bimini road or wall or whatever they refer to it as. It's still highly controversial, but that place has been thoroughly established as artifactual. The structure in Cuba may be part of that. It's very possible it's part of it. they are bread crumbs on the trail and the final discovery of Atlantis is going to be made because the technology now for underwater research is developing at such an extent they are turning the oceans transparent. And what's under the oceans, what's actually hidden under the silt. And I think a lot of Atlantis is not only buried under the water, but under the silt and so on. That discovery is going to be made. That's where it's headed, hopefully in our life time, but I would say definitely in the 21st century Atlantis will be found. I am really confident that is going to happen. WHAT HAPPENS TO THE ACADEMIC WORLD THEN? It is stood on its ear because the academic world has been demanding for the last 100 years that anybody who believed in Atlantis believes in fantasy, they don't know what they are talking about, they are very unscientific. And beyond that, they say civilization just began 5,000 years ago very slowly in Mesopotamia between the Tigris and Euphrates. Well, all of that is going to have to be thrown out! We are going to be looking at something completely different now. In other words, all of the textbooks, our entire concept of where we came from is going to have to be changed." Names for the title of the bump list, anyone? Forget about lowering cameras-2,200 feet down is a shallow dive for many of the undersea reasearch subs. The ruins at North Salem seem to be of Mediterranean style, possibly Phoenician, dated about 1000 BC. There isn't much question that the Phoenicians were most active just before the rise of what I call modern civilization [Rome]. Hapgood said that he believed the Phoenician era was actually between civilized times, that there seem to have been well-developed civilizations before Phoenicians and those civilizations had declined to practical non-existence. Hapgood also happened to be from a town where there is an underground culture that believes the earth flips on its axis now and then. The idea of catastrophe runs deep. All excellent selections! It's a hard choice between the last two, but I'd vote for Gods, Graves, Glyphs, and Myths. I'd vote for Gods, Graves, Glyphs, and Myths. But do dinosaur stories go there, or do they get their own list? That would be one argument for Stones, Bones, Tomes and Thrones. I'll nominate the title of two books by anthropologist Marvin Harris. (He died last week at the age of 74.) Excellent books: "Our Kind" and "Kings and Cannibals" I do like, "Gods, Graves, Glyphs and Myths"though. I believe the original occupancy at North Salem, NH, was in the area of 2000 BC plus or minus 300 years. This was a time of intensive exploitation of copper reserves in the Lake Superior area by Mediterranean technology and societies based in lower Iberia, Tunisia, and even Lebanon. The word "Tartessian" somehow sums that up: the overlords and businessmen Semitic; the laborers (and seamen) probably often Celtic.
" Hapgood also happened to be from a town where there is an underground culture that believes the earth flips on its axis now and then." How about a separate list for Dragons and Dinosaurs? "I could see them fitting into the "Graves" part of Gods, Graves, Glyphs and Myths"
It's time for you to get a reality check, if you still believe all the establishment swill. Really? What swill is that? Meanwihile, don't waste my time with endless piling of speculation upon speculation, show me a video of carvings on rocks from 2200 feet beneath the surface of the sea (which weren't dumped there the week before). Show me evidence, not bullsh!t. Doesn't anyone remember the hyping of the "road" off Bermuda's coast that was nothing but dumped ballast stones? That makes sense to me.!! "Gods, Graves, Glyphs and Myths"
Kind of a provocative title, people would click on it to just see what the heck it is! Anyway /Both sound fine to me!!! Nevermind the question regarding glyphs. It's what a lemming with a head cold jumps off of.